Ladies who lunch, start your mixed green salads. 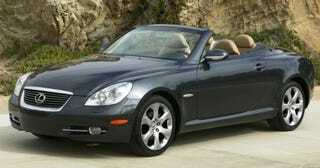 It's the 2008 Lexus SC 430 Pebble Beach Edition, and it's coming soon to a tennis club in Orange County, California. Considering this is the time of year when car enthusiasts' thoughts turn to all things snooty and julip-soaked, Lexus again will give its aging SC a good tricking out. And as usual, they're whipping out the upmarket-sounding phrase book. Check out the Smoky Granite Mica exterior paint, and the exclusive two-tone Camel and Ecru leather trim interior and Espresso Bird-eye maple wood trim. Also note the white illuminated scuff plates, sleek rear spoiler and 18-inch chrome, six-spoke wheels under a set of run-flats. Excuse us while we put the Chardonnay on ice, draw a bubble bath and get out our secret stash of Criss Angel: Mindfreak DVDs. August 15, 2007 - Pebble Beach, CA - Lexus will debut the 2008 Lexus SC 430 Pebble Beach Edition retractable hardtop convertible to commemorate its on-going partnership with Pebble Beach Company. With a limited production of 360 vehicles, the fifth special-edition Lexus SC will be unveiled at the Pebble Beach Concours d'Elegance Lexus Fashion Preview on Aug. 17. The unique exterior design of the SC 430 is complemented by an elegant exterior/interior color combination that will be exclusive to the Pebble Beach edition SC. This special SC will feature a Smoky Granite Mica exterior paint combined with an exclusive two-tone Camel and Ecru leather trim interior and Espresso Bird-eye maple wood trim. Additional styling cues unique to the Pebble Beach SC include special-edition brushed chrome badging on the front fenders and center console and an Ecru Pebble Beach logo embroidered on Camel carpeted floor mats. The Pebble Beach SC will also feature White illuminated scuff plates, a sleek rear spoiler and aggressive 18-inch six-spoke chrome wheels equipped on all-season or summer run-flat tires. In addition to its elegant styling, the Lexus SC 430 hardtop convertible benefits from its ability to hide the roof within the confines of its trunk in a mere 25 seconds, while still maintaining enough room for luggage. All without latches, catches, snaps or covers. And when the top is up, it defies traditional convertible logic by remaining solid, secure and weatherproof. The rear-wheel drive SC 430 is powered by a 288-horsepower, DOHC, 4.3-liter V8 engine with Variable Valve Timing with intelligence (VVT-i). The aggressive V8 is mated to a six-speed sequential-shift ECT-i transmission to achieve a 0-60 time of 5.8 seconds and an electronically limited top speed of 149 mph. In addition to its impressive performance, the SC is certified as an Ultra-Low Emissions Vehicle II. The SC features a number of technologies designed to enhance driver visibility including an Adaptive Front lighting System headlights, which help better illuminate a turn as the driver steers into it. The SC also includes daytime running lights, fog lamps and projector High-Intensity Discharge (HID) headlights. Dynamic handling is accomplished with standard features that include an Anti-lock Brake System (ABS), Electronic Brake-force Distribution (EBD), Brake Assist, traction control (TRAC) and Vehicle Stability Control (VSC). Every SC 430 comes standard-quipped with a Mark Levinson® Premium Sound System. This extraordinary system has been configured to self-optimize performance for top-up or top-down driving. Designed by one of the audio field's legendary innovative brands, the SC 430's system uses a seven-channel DSP 240-watt amplifier and nine strategically located speakers to turn the SCs interior into a private concert hall. System equalization automatically adjusts when the roof is lowered to compensate for the changed acoustics and ambient noise levels, and it returns to its original levels when the roof is raised. The 2008 Lexus SC Pebble Beach Edition will be available for purchase in late August.